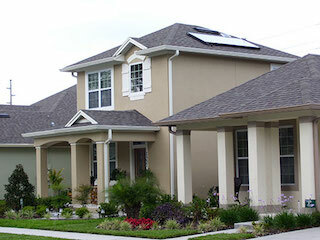 Save up to 90% on your home’s water heating costs with a solar hot water system. In 2015 our company was named the #2 Solar Water Heating Contractors in all of Florida by Solar Power World. Hot water heating costs make up 25% to 30% of the average home’s electric bill. Solar hot water heaters are the most effective and energy-efficient way to generate hot water for your home and shrink your monthly power bill. That’s why 1.5 million homes and businesses in the United States made the switch to solar. Cost-effective. Solar water heaters are the most cost-effective way to generate hot water for your home year-round and can save you thousands of dollars over a 20-year period. Return on investment. Installing solar in your home is one of the safest investments you can make. The system can pay for itself within 3 to 5 years. Clean power. Traditional electric water heaters emit two tons of CO2 into the atmosphere on average. Solar water heaters use clean power and produce no greenhouse gas emissions. Tax Credit. Solar water heaters qualify for a 30 percent Renewable Energy Federal Tax Credit from the government and rebates from many local utilities. The way in which solar hot water systems, or solar thermal systems, operate is simple. Solar panels are heated from the sun and the water that runs through them also gets heated. The heated water is then ready for use. There are two types of solar water heating systems: active and passive. Active Systems - An active solar hot water system uses a pump that circulates water through the system. Active hot water systems will reduce water heating costs by up to 90%. There are two types of active systems: direct circulation (open loop) and indirect circulation (closed loop). Passive Systems - A passive solar hot water heating system does not use a pump. Instead, it relies on convection to move water through the system. These systems can supply homes with up to 75% of their hot water use. They have the fastest payback of solar thermal systems (usually within 3-5 years) and are less expensive to install than active systems. While they are not usually as efficient as active systems, they can be more reliable and last longer. While they do not reduce water heating costs as much as active systems, they still reduce water heating costs by up to 75%. There are also two types of passive systems: integral collector (storage passage) and thermosiphon. I knew I wanted solar hot water heating because it would recapture my investment in the shortest amount of time. I thought I could install the system myself, but after reviewing the cost, the dangers, and the technicalities of the installation, I opted for installation by a reputable company. Superior Solar fit my needs. With good reviews from the BBB and excellent explanation from the sales person Nick, I signed up and have no regrets. I was very pleased. During the installation, they were very professional and cleaned up as they progressed. They disposed of my large gas water heater and installed the new unit, which with the solar has a larger capacity. Everything was completed in one single day and has worked well ever since. The system is very durable and basically does not require any routine maintenance. Best of all, I received all my credits from local and federal programs.